On this day, two hundred and forty years ago, the first Continental Congress approved the final draft of the Declaration of Independence in a little red brick Philadelphia building. That’s right. According to ConstitutionFacts.com, Congress did not sign the Declaration of Independence until August. July 4th, 1776 happens to be the date included on the final approved version. After the deaths of Thomas Jefferson and John Adams, both on July 4, 1826, July 4th became an important date to remember. 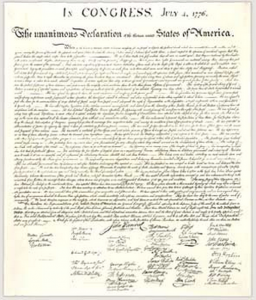 In 1870, Congress passed a resolution declaring July 4th a National Holiday. Everyone can watch a reading of the Declaration of Independence on Live Stream. On July 4th every year, Americans everywhere celebrate with BBQ, yard games, and family thanks to the patriots that stood for freedom and liberty. Please take a moment this weekend to pray for those that served and those that continue to stand for liberty today. And don’t forget the families that stand alongside those brave men and women.